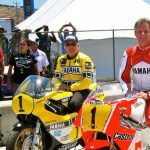 Press Release from Ducati: From July 8–10, Northern California motorcycle enthusiasts will have the opportunity to experience Ducati’s past, present and future during the World Superbike Championship races at Mazda Laguna Seca Raceway. 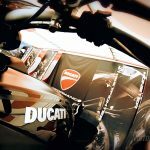 The Italian brand will be setting up a Ducati Island at the Monterey, California racetrack that will include a Consorso display, rider experiences, and a retail store. 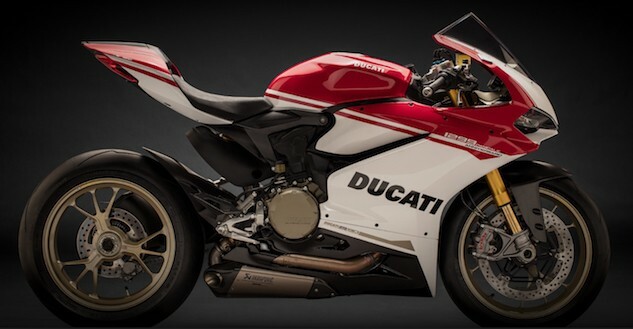 In addition to a Superbike Concorso displaying the history of the Ducati Superbike, attendees will be able to witness the North American debut of the Ducati 1299 Panigale S Anniversario planned for Saturday afternoon July 9th after the 1st World Superbike race. Limited to 500 units, the 1299 Panigale S Anniversario is an homage to Ducati’s history, fitted with a 205 hp Superquadro twin-cylinder engine. This was created to celebrate Ducati’s 90th anniversary, and features a distinctive special graphics with gold-colored wheels along with weight-saving enhancements like a lithium-ion battery and various pieces in carbon. 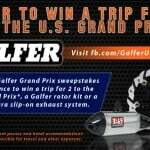 Addressing performance, it also includes a gold-colored titanium Akrapovic exhaust and also incorporates the updated electronics of an evolved wheelie control and evolved traction control that now ultizes the motorycle’s lean angle. The Ducati Island at Laguna Seca event is open to all attendees of the World Superbike Championships. Other exciting activities include World Superbike rider appearances, a custom Scrambler display, a track walk with riders and various owners’ benefits at the exclusive Owners’ Lounge.